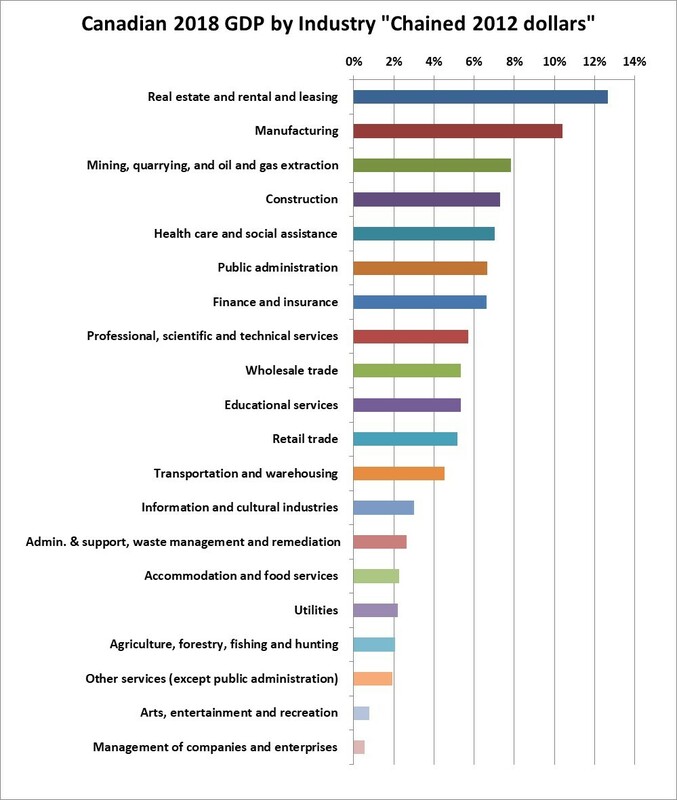 Which industries contribute the most to Canada’s economy? In terms of Gross Domestic Product (GDP) what are the percentages from oil and gas, real estate, construction, government services, forestry, farming, financial services and manufacturing etc.? The answers below might surprise or even shock you. What portion of Canadian GDP do imports and exports make up? What products does Canada Import and Export? Which countries, other than the United States, are important trading partners of Canada? Firstly, what is the meaning of GDP? GDP or Gross Domestic Product refers to the total dollar value of recorded economic production within a country. It measures the final value of all goods and services produced. The GDP of a particular industry is (roughly) the value of its sales minus the costs of goods or services purchased from other entities. The GDP of a particular industry measures the economic activity directly generated by that industry. The GDP of a particular industry is not a measure of its profit or value added since it does not deduct the cost of labour from the value of sales. GDP is often criticized because it does not include the value of unpaid work or of unreported economic activities such as the “underground economy”. Nevertheless, GDP is the best available figure for use in understanding the economy and the relative importance of each industry to the economy. What is Canada’s GDP by industry or sector? As of the end of 2018, Canada’s reported GDP per year, in 2018 dollars, was running at $2.223 trillion or $2,223 billion per year. The following chart shows the percentage contribution of the various goods and services sectors to the total. Note however that this is based on something Statistics Canada calls 2012 chained dollars, which, I understand, basically assumes that there were no price changes since 2012. I would prefer to use current dollars. However, for complicated reasons, Statistics Canada produces figures on GDP by industry in current dollars only on a three year lag basis. From reading the financial news you may have been under the strong impression that Canada’s GDP is dominated by the commodities including particularly oil, gas, and various minerals. You may have also heard that manufacturing is no longer such an important component of Canada’s economy. The actual figures show that “Real estate and rental and leasing” is the largest segment of Canada’s economy at 12.6%. And this does not include constructing real estate. The high percentage related to the use of real estate may seem high. But then again perhaps the most defining characteristic of any developed economy is the presence of buildings and improved land of all sorts. Manufacturing, while it may be lower than in years past, is still a very large portion of GDP and is the second largest component at 10.4%. Note that manufacturing includes process industries such as oil refineries, pulp mills and chemical plants. Surprisingly, mining, quarrying, and oil and gas extraction is only the third largest item at 7.8% of GDP. And I believe it would be an even smaller percentage if Statistics Canada were using current dollars rather than “chained 2012 dollars”. If you click the source link above, Statistics Canada shows this segment as being 7% larger in dollars of GDP than it was in 2014. That would not be true in current dollars given lower oil prices. It appears to me that Statistics Canada’s method is designed to capture the volume of activity but is not reflecting the relative price drop of oil versus other prices in the economy. Review the rest of the chart to see the composition of the Canadian economy and the percent contribution of different segments. See the link to the latest available source data just above to see the raw data if desired. The figures here were based on December 2018 annualized. When you hear that Consumers “account” for about 58% of Canada’s GDP, that does not mean that business accounts for little. In fact Businesses and (yes) government create the GDP and Consumers consume the largest share. This should not be considered surprising or alarming. Why else should things be produced except for consumption? (and for some investment to fuel future consumption). A surprisingly large 22% of Canada’s GDP is expended on investment in (the creation of) longer lasting assets such as buildings (including houses) and equipment rather than being consumed for immediate gratification. This includes replacing and upgrading worn out buildings and assets which may account for it being so high. The largest category of goods export, by far, is Energy Products (oil, bitumen, refined petroleum, natural gas and other) at 21.6% of total exports followed by motor vehicles and parts at 11.1%. Perhaps surprisingly, Commercial Services were the third largest category of exports at 10.7%and Consumer Goods were next at 8.4%. Canada has a certain reputation for exporting relatively unprocessed natural resources. But despite exports of crude oil and natural gas and some raw metals, minerals and timber, the vast majority of exports are in the form of products and services. To Which Countries Does Canada Export? Note that our data source does not include services in the exports-by-country data. Given the recent tensions over trade with the United States, it would be beneficial if Canada were less reliant on trade with the U.S. But the statistics for 2018 show that the United States accounted for the vast majority of Canadian goods exports at 77%. The European Union collectively is the second largest export destination but accounted for only at 8.1% and China was third at only 5.1%. Things may be changing and China is an important “customer” country for Canada. But the fact is, for now, when it comes to Canadian exports, the United States remains our number one destination by far. Japan, in fourth place, accounts for only 2.3% of Canada’s exports. And Mexico, despite its proximity accounts for only 1.7%. 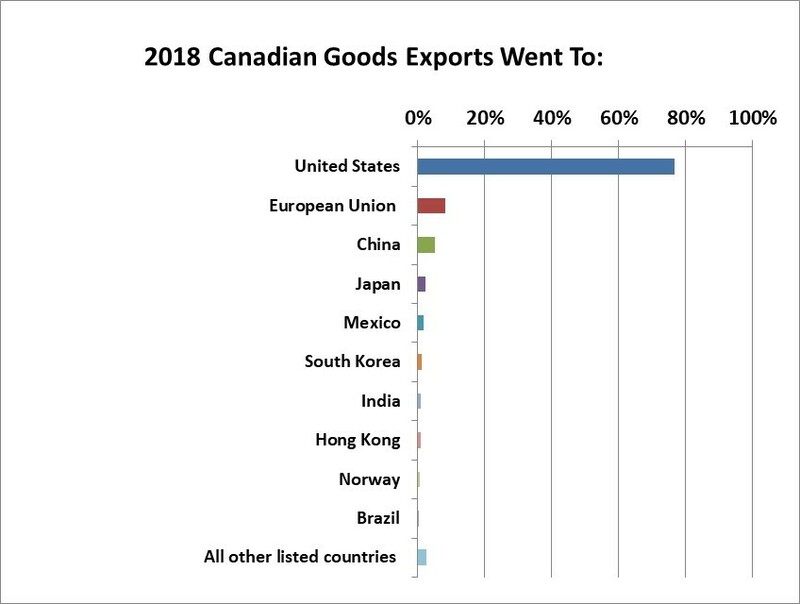 The chart illustrates that fact that Canada’s exports to all but a tiny handful of countries are almost insignificant. Treating the European Union collectively, you can literally count all of Canada’s important trading destination countries on the fingers of one hand. The extent of the reliance on exports to the U.S. is sobering and, given recent trade tensions, alarming. 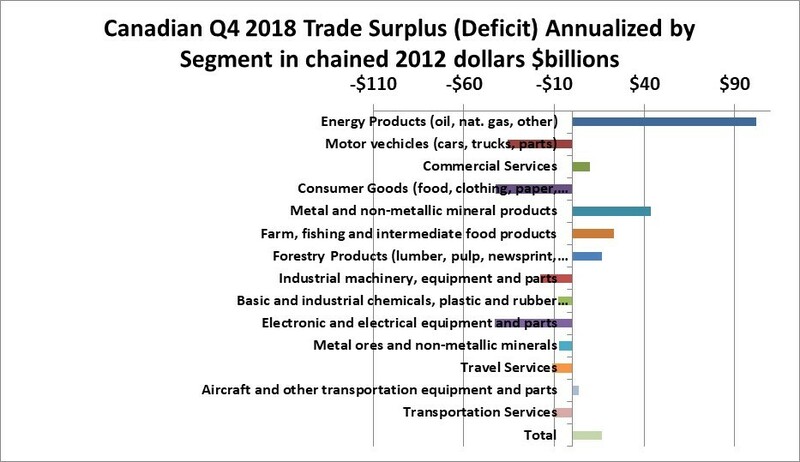 As at Q4 2018, Canada’s seasonally adjusted and annualized imports of goods and services were 29.5% as large as its GDP and amounted to $655 billion. 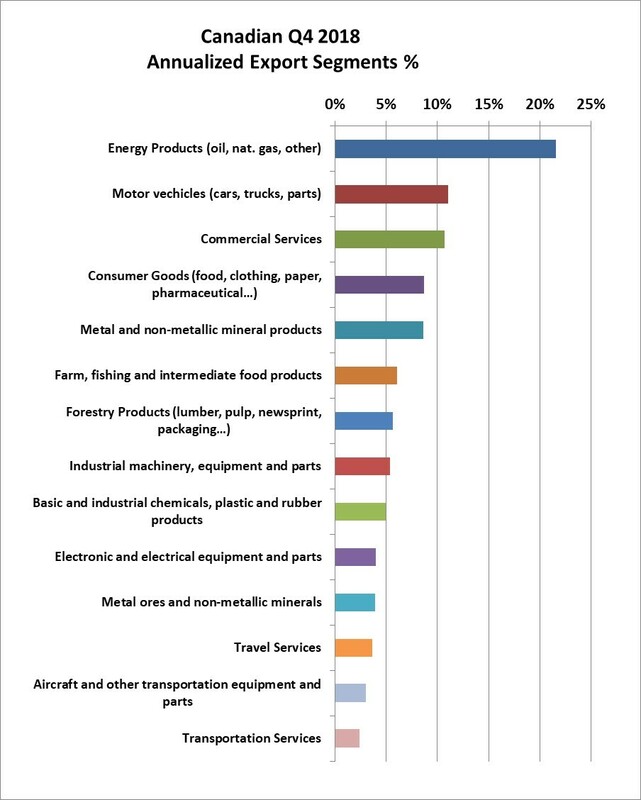 The following chart shows imports by industry segment as a percentage of total goods and services imports. The chart indicates that motor vehicles and parts constitute 17.1% of total goods and services imports while consumer goods constitute 15.7. Electronic & electrical equipment constitute 10.9% and commercial services constitute 9.6%. Energy products account for 6.3% of imports. From Which Countries Does Canada Import Goods? Note that our data source does not include services in the imports-by-country data. The United States accounts for 67% of Canada’s goods imports. It has been noted that Canada’s imports from the U.S. are not a very large share of the GDP of the United States – at about 3%. That is true, but exports to Canada are crucially important to many of the individual exporting companies and their employees. The European Union collectively accounts for 11%. China accounted 8% and Mexico for 4%. The remaining 10% is spread widely around the globe. Most of the other countries in the world are insignificant to Canada in terms of imports. For Which Products and Services is Canada a Net Exporter and For Which a Net Importer? Canada is a net exporter of energy products, metal & mineral products, farm, fishing & intermediate food products, commercial services (likely mostly banking and insurance), forestry products and aircraft & other transportation equipment & parts. 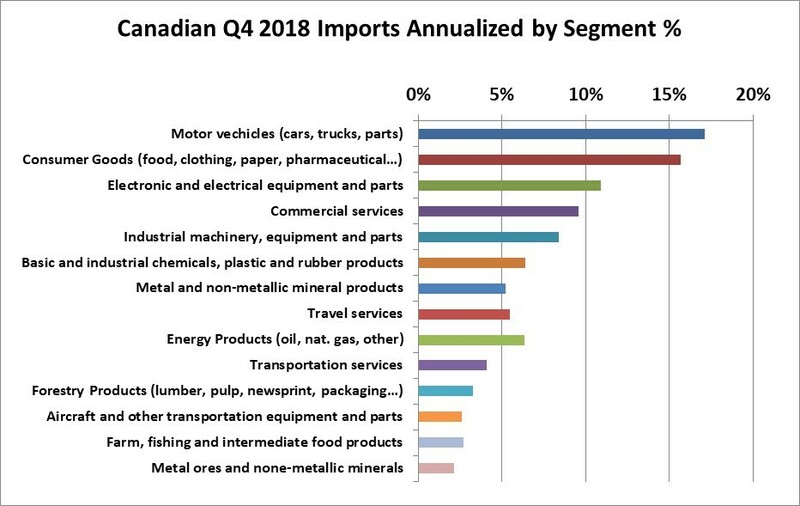 Canada is a net importer of motor vehicles & parts, consumer goods, industrial machinery, basic & industrial chemicals & plastic & rubber, electronic & electrical equipment, transportation services, travel services, and (apparently) metal ores & non-metallic minerals. Originally created November 3, 2007, the latest annual update was March 31, 2018.